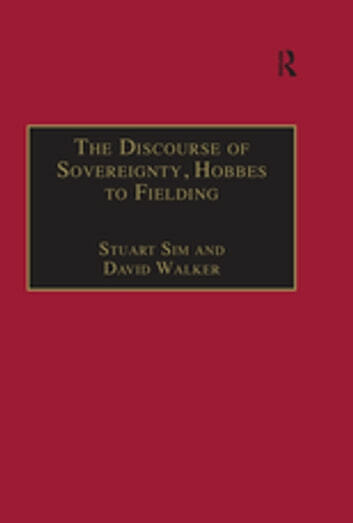 In this new study the authors examine a range of theories about the state of nature in seventeenth- and eighteenth-century England, considering the contribution they made to the period's discourse on sovereignty and their impact on literary activity. Texts examined include Leviathan, Oceana, Paradise Lost, Discourses Concerning Government, Two Treatises on Government, Don Sebastian, Oronooko, The New Atalantis, Robinson Crusoe, Dissertation upon Parties, David Simple, and Tom Jones. The state of nature is identified as an important organizing principle for narratives in the century running from the Civil War through to the second Jacobite Rebellion, and as a way of situating the author within either a reactionary or a radical political tradition. The Discourse of Sovereignty provides an exciting new perspective on the intellectual history of this fascinating period.